Image caption One Sony worker said the two kitchen workers were "running around chasing each other"
One member of Sony staff said the catering workers had been "running around chasing each other." Both were later arrested by police. In a statement, Sony said two members of the catering team had been "involved in a violent altercation" and it was being investigated by police. The member of staff, who did not want to be named, said they had heard "screaming and running and people slamming doors". They added the two kitchen workers were "slashing each other up". People were evacuated from the building and roads nearby were closed "as a precaution". 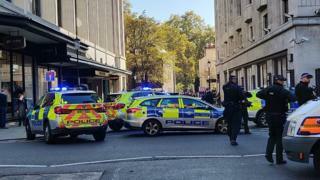 "Then running down the road came a whole host of armed police officers, followed by paramedics," she said. 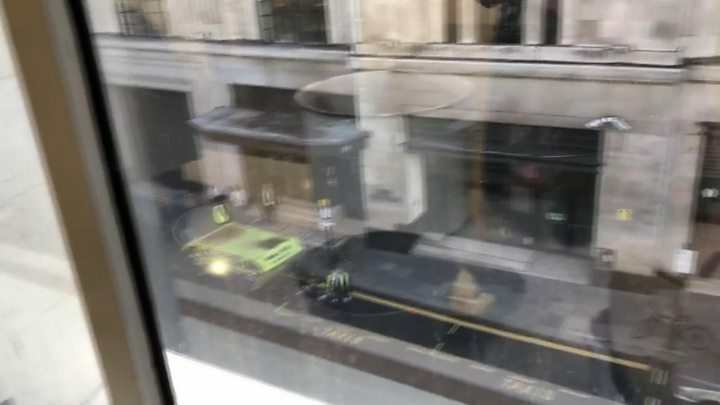 Video Two stabbed at Sony HQ in Kensington, London.